I have read alot of people have issues running their rustler vxl 4x4 on 3s and breaking the stock plastic driveshafts. What has everyone found to be the better upgrade out of all the different brands to go with? I saw someone used the MIP, traxxas slash metals and they were relatively cheap. Would y'all mind send part numbers with your recommendations as well please? Don't get the traxxas metal ones. Save up your money and get MIPs. I run them with 3s and a castle motor and they are great. It's a 3-way tire, depending on who replies. One camp with tell you MIP, and another will tell you Tekno M6, while a third (the "camp" I'm currently a part of...tho I am research the other two) will tell you the Traxxas steel CV driveshafts (part #6851R & 6852R). From what I understand so far, you can't go wrong with any of these three. I've read good things on the Teknos and cost seems cheaper than the other two. Also read about MIPs breaking lately. Heard Traxxas shafts were good but pricy just like MIP. Have my eyes on Teknos but price isn't the deciding factor. I've read lots of good things about the Tekno Big Bore center driveshafts, and I plan on using it in my Slash 4x4 build-up. However, I really wish they would start making a version for the Rustler 4x4, as I'm also going to start a project based on that chassis soon. Gonna have to go back on that “can’t go wrong with Traxxas CV driveshafts. You really can lol. They’re fine up to 3s but on 4s with an 8th scale motor they show their weakness. Let alone 6s. For the "Rusty" & "Slash" projects (both of which will be running 2S only, for track use), I'm currently considering between the 'standard' Traxxas CVs (5mm), the XO-1 CVs (6mm), and the Tekno M6s. The MIP driveshafts could have been a possibility...except for all the recent complaints. While I might use the same driveshafts on both vehicles, it's unlikely, as one will be running 2.2"/3" SC wheels (12mm hex), and the other will be running 1/8 buggy wheels (17mm hex). Last edited by Panther6834; 02-11-2019 at 10:32 AM. Nope, you heard me wrong. I wasnt complaining at all. The op clearly asked for a set of driveshafts that would hold up to those 2 8th scale motors he listed, and those traxxas cv's wont. Not sure what I did wrong saying something wont work, when it actually wont work. Making a stupid decision on overvolting an esc (That has physical limitation making it not arm when more than 3s lipo is plugged in) is not the same thing as recommending you not buy driveshafts that will break under the use he wants. As for Panther, traxxas slash cv's will be fine for your build. For the OP he'll need to use the xo'1 shafts and diffs if he doesnt want tekno or mip. All 3 of those options will work though, its down to preference. Last edited by Peeeenuuutt; 02-11-2019 at 10:50 AM. Sorry about that peeeenuutt, I misunderstood. Thanx. I had a feeling the Traxxas 6851R/6852R would work for racing, especially on only 2S. Since one of the vehicles will be running 1/8 buggy wheels/tires, the next thing I (or, technically, anyone needing to 'upgrade' to 17mm hex wheels) need to figure out is whether to go with a 17mm "conversion kit" (such at the STRC ST1654-17), or a hex wheel hub set (such as the Traxxas TRA5353X or TRA6469. Last edited by MrTbone90; 02-12-2019 at 02:01 PM. So overall everyone says with running tekno m6 or the traxxas steel axles are the best? Do y'all have a part number for the tekno? TKR6851X for the front and TKR6852X for the rear. 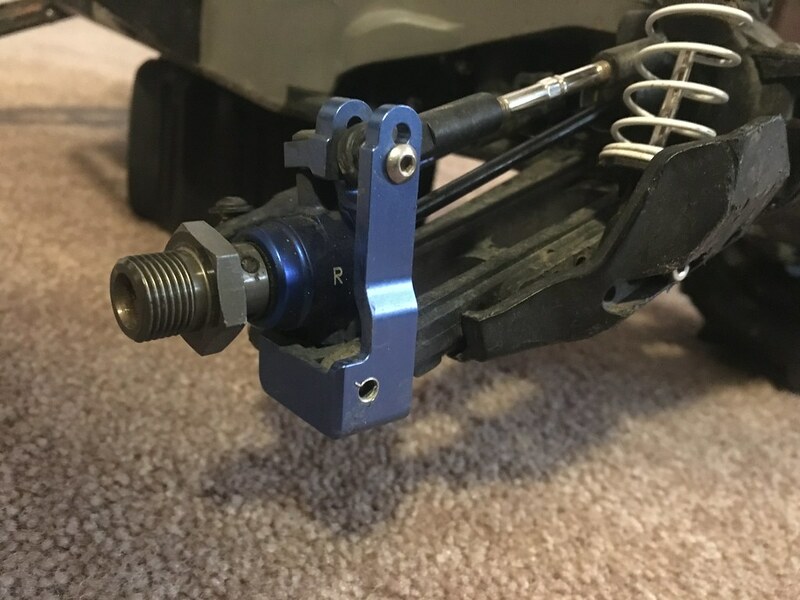 I won't say they're the best as I haven't tried anything else besides stock, but they're working well for me, and at a fraction of the cost of MIP or Traxxas shafts, and also include more robust rear hubs, steering knuckles and larger bearings. Can't beat the value, in my opinion. Last edited by SeekerOfTruth; 02-12-2019 at 03:47 PM. So, the tekno m6's work with stock hubs, knuckles and bearings, or would those need to be replaced to use these? I have seen a video where someone got mip cvd's and they were rusty and he had to polish them up and remove the rust. Not sure if that was because he had them siting around, or where sitting around at where ever they were purchased from. Thank you for the help everyone! Does anyone have the part number for MIPs front and rear? The tekno's come with everything you need. They come with hubs bearings and wheel hexes. You can use the stock knuckles. I’m currently still rocking the plastic shafts on my 100mph+ rustler. Surprisingly they have held up for me but all I do is speedruns. About to replace them with Tekno M6 axles. Well, My Rusty raced for the first time tonight, in the Rookie class...even though the upgrades aren't finished yet (still need to install the Tekin RX8 ESC & Pro4 motor). Ended the night in 3rd place...but it wasn't "the end" of the Rusty's night. That came when the winner took a 'victory lap', and, after finishing his lap, crashed into the rear passenger side of my Rusty, snapping the steel Traxxas CVD driveshaft. The owner of the shop/track said he's never seen that happen with a Traxxas CVD driveshaft. Don't know if that was the truth, and not sure it made me feel any better...but, 15 minutes, and $55 (incl tax), later, my Rusty was back to being in working order, and will be ready to hit the track (for more practice) tomorrow. Sorry to hear that, Panther. I've seen some 1:1 victory lap incidents, as well. No worries. Whether bashing, or racing, it's part of the price we pay to enjoy this sport/activity. Of course, it probably costs bashers more in the long-run...lol. 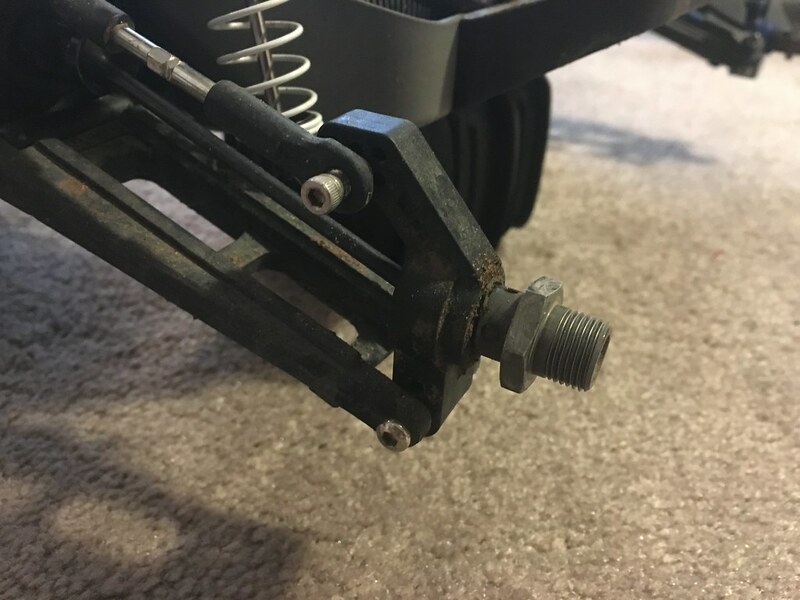 Be careful with those traxxas cvd's. If they break over and over again (i doubt they will) maybe try a different brand. On the 'plus' side, I called Customer Svc, and they've sending a replacement...not the entire driveshaft, but the part that snapped. Should receive within a week, and can rebuild that driveshaft, to save as a backup. Guess you can look at it as you have spares now! It cost to be the boss!! Just joking, all kidding aside, it probably isn’t a bad idea to keep spares even though they are steel driveshafts. So very true...and true. To be honest, I've been considering swapping out the Slash/Rustler 5mm CVDs, and replacing them with the 6mm CVDs from the XO-1. While the driveshaft is 5mm, the wheel arm is only 3-4mm. Where the **** pin is, that's the weak point...if the pin is 1mm, then there's only 1-1.5mm on each side of the pin. With the XO-1 driveshafts, the metal on each side is increased to 1.5-2mm. Besides, for my two project vehicles based on the Slash & Rustler 4x4 chassis, I was already planning on using the XO-1 driveshafts, front & rear, on both vehicles...might as well have the same driveshafts on all three vehicles, right? That way, I could, if needed be, 'borrow' from one of the other two vehicles, while waiting to replace the other. I REALLY like the Tekno M6 driveshafts! I've had a set on my 2wd Rusty with Castle 3800 motor and 8th scale ECS run predominantly on 3s and have never broken a driveshaft. I picked these fro my 2wd Rustler over MIP since they are much lighter and the car if fast and light, set up for sand dunes, so I didn't want to add weight. I then bought a LCG Slash 4x4, and kept breaking the stock driveshafts, so time to upgrade. I considered the MIP, but bought the Tekno so I'd have greater parts compatibility with my cars. I'm now running 4s 8th scale power in my Slash, and have yet to break a Tekno axle. What I have broken - a lot - with 8th scale speed and 2.8 tires in the Tekno plastic C-hub. I upgraded to the XO-1 C-hub and carrier, and never broke another. While there is no aluminum option I'm aware of with the Tekno rear axle, between both my cars, I've only broke 1 rear hub ever. Here's some pics. I have the 17mm hub conversion, but the Tekno axles come with the 12mm parts. Yes, I know this is a Rustler 4x4 page, and I will own one this weekend, and will be putting Tekno axles on it once I break a stock one. I bought the XO-1 shafts and aluminum for all corners off TheEBay. 17mm wheels and no problems bashing HARD. That was what I was initially going to do, but I couldn't find the XO-1 axles at what seemed a reasonable price. If they save you from repeatedly braking the thinner axles, I'd say the price they still for should be considered "reasonable". I also have spare bearings and dogbones from my redcat's driveline. Once I can compile lists (one list for each vehicle) of all the spare parts I should have on-hand, I will work towards getting them, as well as having storage containers for said parts. Thankfully, three of the vehicles will share a lot of the same parts, thus having "spares" on-hand is that much easier, plus saves money. Agreed. Except for the plastic C-hub (which I replaced with XO-1 parts), I haven't broken any Tekno axle parts. I run Tekno M6 and MIP X-Duty CVDs on my 2 Slash 4x4 LCGs with no problems. Tekno is not planning on making a big bone CD for the rustler. At least not at this time. I just bought a front set of GPM brand cvd's for the front of my Slash or Rustler. Have decided which one to put them on LOL. I believe they are the same size? ?